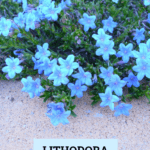 One of my most popular blog posts has been the one I wrote a year ago on Lithodora. 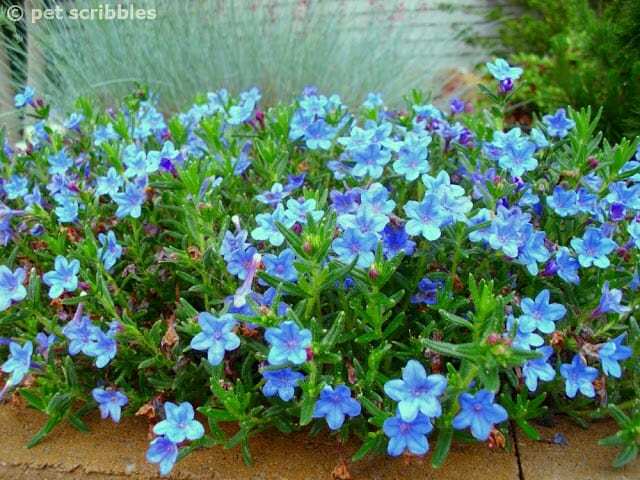 I titled it, Lithodora: Evergreen and Electric Blue Radiance because I was so impressed with the flowers being such an intense shade of blue. 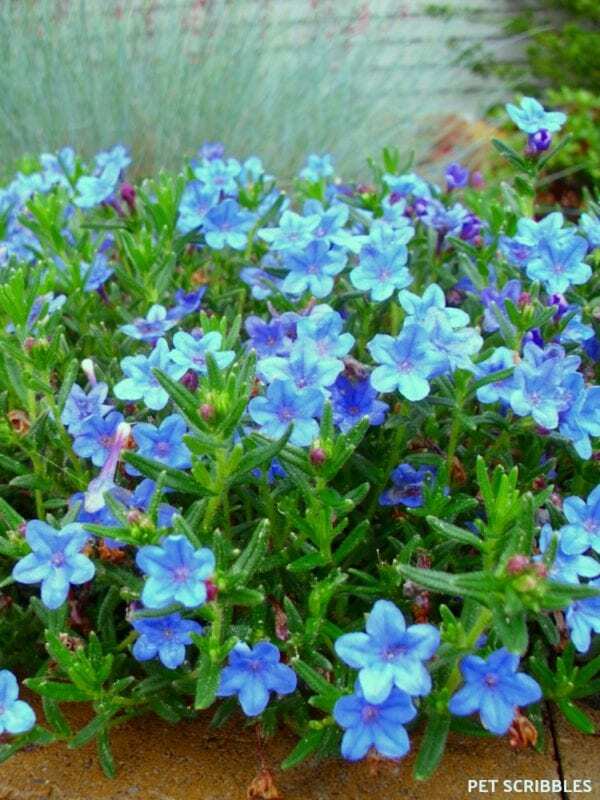 The added bonus that Lithodora is evergreen means you get to enjoy the green foliage during the Winter months. 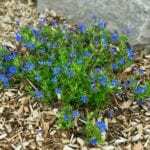 You can read all about how to grow and care for Lithodora in my original post, but I wanted to share these new pictures with you because I think it’s helpful to see how a plant does through the years. 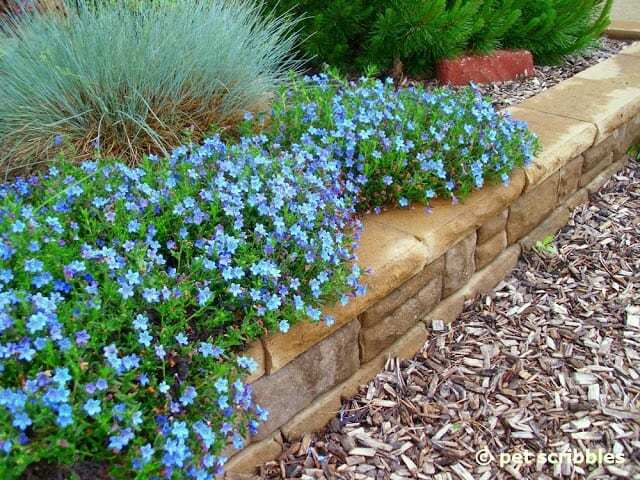 Then you can decide if it’s one you want to try in your own garden. Right now our Lithodora is in full bloom, and on a cloudy day like today, its blue flowers do seem to be lit up! The color is gorgeous, and oh how this plant has spread since last year! 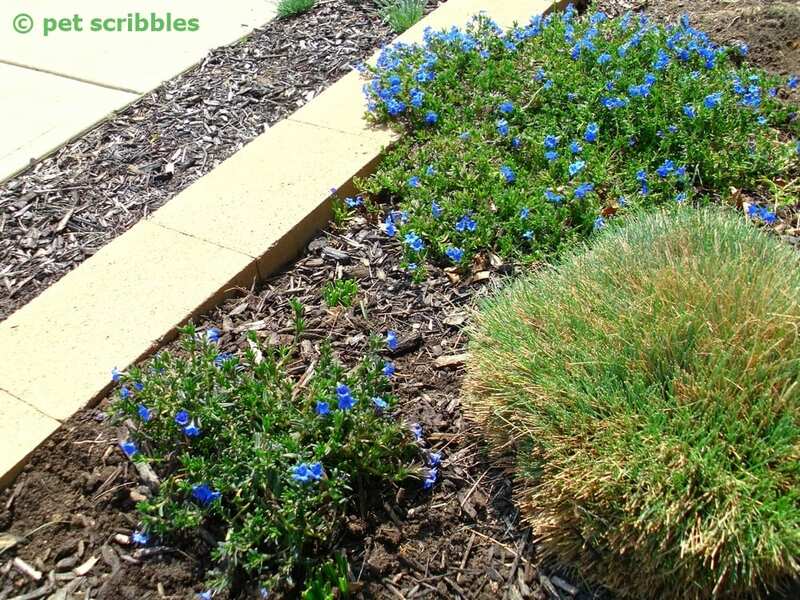 In the image above, the small patch of Lithodora on the left was newly planted, while the larger patch on the upper right-hand side of the image was two years old at the time. 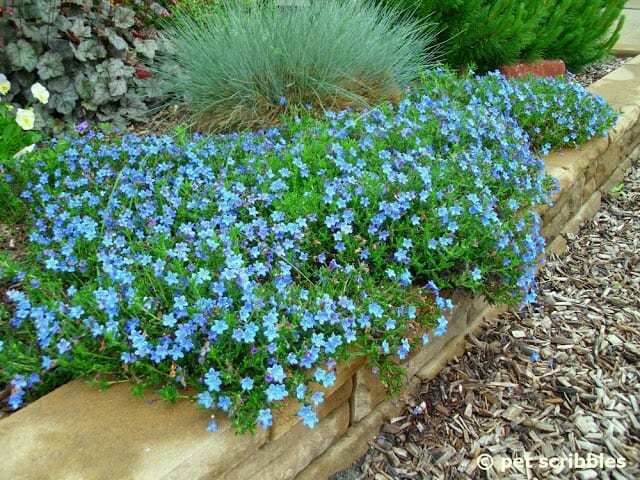 Gorgeous spread, plentiful blooms, and a vibrant blue color! 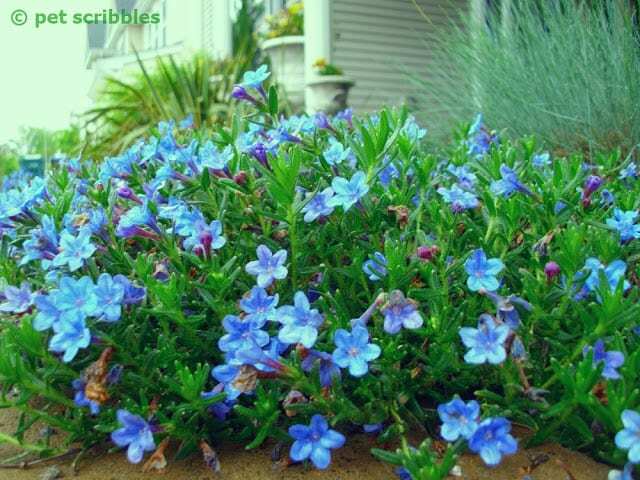 You can see how the old and new Lithodora plants have merged. 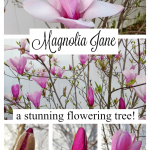 In the two images below, you can see several flower buds yet to open. The buds almost appear to be a medium purple color, which makes the blue blooms that much more special! 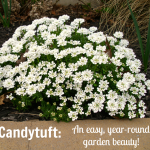 This is an easy-care plant. It can trail over walls, in rock gardens, or you can trim it back and contain it within a specific area. 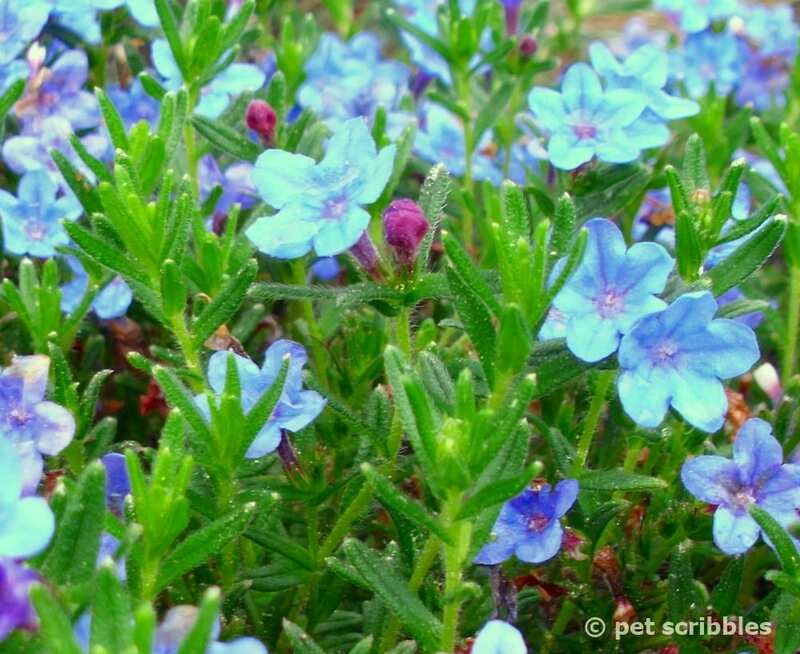 Make sure to read all about this plant, then get to a nursery and treat yourself — and your garden — to the blues! Yes they are lovely and worth every penny. I love plants that reward and surprise us year after year. Very nice! So glad to hear from a fellow gardener, Vetsy! You’re right about rewards and surprises: that’s a major part of the joy I get from gardening! Wow, gorgeous! Will file this away for when we finally buy a home. 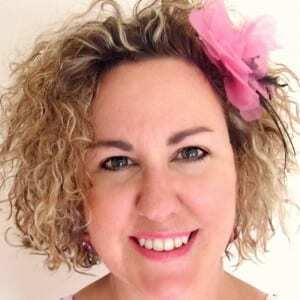 Thanks so much, Laura! 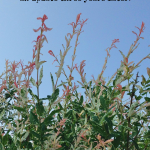 You might be surprised and find that some of the roots will actually sprout up some new plants! That’s what happened to us after we thought we had dug up and removed the ‘dead’ plants! 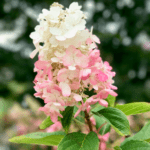 However, if your local nursery doesn’t have them, I’d try an online mail order catalog – search for perennial flower catalogs via Google or Bing – and you should be able to find something. Keep an eye on where you dug them up however, as they might surprise you with some sprouts! Fingers crossed! Amazing blue! I love this flowers, thanks for sharing!